The Eve Room is a smart climate sensor, which measures the temperature of your home, while also giving you information about air quality and humidity. These three key data points help you get the ideal climate within your home. The data it gathers is presented in beautifully constructed graphs, allowing you to better predict how much money you’ll be spending on energy with the help of your previous data. The Eve range of products has been designed specifically for the Apple HomeKit, which allows you to operate the device using a range of Apple devices, as well as get up-to-date information via voice command with Siri. Eve Room is an indoor climate sensor that helps you have a healthier, more comfortable home. It’s one of the few smart sensors that detects levels of VOCs, which have been shown to cause headaches and other unpleasant symptoms. The Eve app also lets you set up your own ‘Scenes’. This lets you do things like have the humidifier automatically turn on when humidity levels go above the desired threshold. Flexible placement: Put it right where you want it. The Eve Room is battery powered, meaning it can be placed freely within your home without having to think about power cables or electrical outlets. 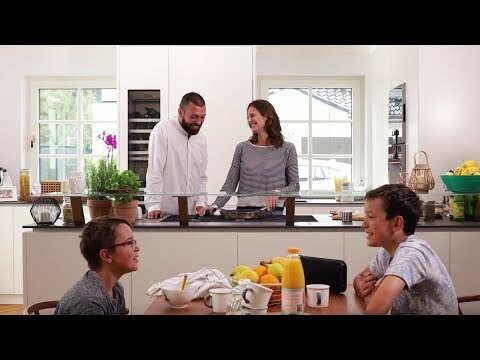 A healthier home: The climate sensor detects for volatile organic compounds (VOCs), which are suspected of causing symptoms such as headaches and eye irritation around the home. The Eve Room helps you keep on top of these and create a healthier home. Set the scene: The Eve app allows you to create ‘Scenes’, which trigger specific devices depending on the current readings being taken. You can thus have the ideal home without having to constantly monitor the device. You could have an air purifier connected to an Eve Energy switch on when VOC levels exceed a certain limit. Apple TV: Connecting your Eve Room with Apple TV makes it possible to integrate your device into your Wifi network. This also allows you to continue to use and monitor the device when you’re not at home. Download the Eve App on your compatible Apple device and switch on Bluetooth. You’ll find an eight-digit code on the back panel or bottom of the device. Enter this code into the Eve App and specify the room you want to use it in. Set up is now complete and the device gets straight to monitoring the room it’s been placed in. It may take a few days for it to calibrate to its surrounding and deliver consistent measurements, particularly if a room has been freshly painted. IThis indoor climate sensor sets itself apart from the competition in that it detects for the presence of volatile organic compounds (VOCs). VOCs are produced by sources such as synthetic materials, cleaning products, cigarette smoke and barbecues. The product is a bargain when you consider that the price of a standalone VOC meter is about the same as the price of the Eve Room (which also detects for two additional values). The product communicates with your Apple device via Bluetooth, meaning it’s not susceptible to Wifi outages (however connecting it with an Apple TV lets you connect it into Wifi). The data that the Eve Room collects are presented in the form of beautifully designed graphs. These help you keep track on how values have been over the last day, month and year. This can be helpful for households who are on a budget, allowing them to plan ahead their energy usage accordingly. The Eve Room is just one of the many Eve devices - its capability increases dramatically when used along with other Eve devices. It can also be used in conjunction with other HomeKit compatible devices. Simply put in the 3 AAA batteries included at delivery and follow the set up instructions in the quick start guide. Eve always produces stable hardware that looks good and feels comfortable in your hand. There's no difficulty in connecting the app to the device, all you have to do is scan in the serial number. All devices can be seen and controlled in one overview, with the drop down menus being easy to navigate. Detects for current levels of temperature, air humidity and VOCs present in the air. Can be used as a device to trigger ‘Scenes’ within the Eve app. HomeKit compatible. The indoor sensor functions superbly granted that no thick surfaces block the Bluetooth signal between the device and your phone. The temperature and humidity measurements it delivers are accurate. The Eve Room has the feel and aesthetic of an Apple product. The minimalist white color and easy form give the feeling both of simplicity and high-grade engineering. Through end-to-end encryption and authentication, Eve is unable to see any data which you device saves. Communication between smartphone and app is well protected. Very competitive price for a sensor that can detect VOCs, and other household irritants. Is the Eve Room able to sense carbon monoxide (CO)? The Eve Room is not capable of detecting carbon monoxide. Is the Eve Room capable of measuring carbon dioxide (CO2) levels? The Eve Room is not able to measure CO2 levels directly. However, it uses a metal oxide sensor capable of measuring the presence of various gases in the air, which are of importance in determining general air quality. These include alcohols, aldehydes, ketones, organic acids, amines, as well as aliphatic and aromatic hydrocarbons. The gas concentration measured is converted to a CO₂-equivalent with the help of an algorithm, which is then available as a general air quality level in the Eve app. Can Eve Scenes activate themselves automatically? You can have scenes activate themselves automatically with the help of triggers such as a change in the location of your smart device as well as a change in temperature. Do the Eve Room devices always display the most recent measurements? The app collects and displays data from Eve Room every 10 minutes. The values collected alter themselves gradually so a more frequent collection of data isn’t necessary. This lower rate of data collection also saves on battery power. Data from Eve Room is saved for approximately 14 days. Data history is saved until the data storage of the device is full. Older data will then be overwritten. What should I do if I think I’m getting false measurements with my Eve Room? If you suspect the values being delivered aren't correct, you should first take the batteries out of the device for 15 seconds and then put them back in again. This soft reset can sometimes solve the issue. If the problem isn’t solved by doing a soft reset, you can follow the instructions for fully resetting the device found in the operation manual of the device. Can I access my Eve Room remotely using the Apple TV? The Apple TV (3rd Generation onward) lets you control any Eve device, hence also the Eve Room, compatible with HomeKit when you’re not at home. Remote access requires an iPhone, iPad or iPod Touch with iOS 8.1 or higher. Can I control the Eve app via voice command?